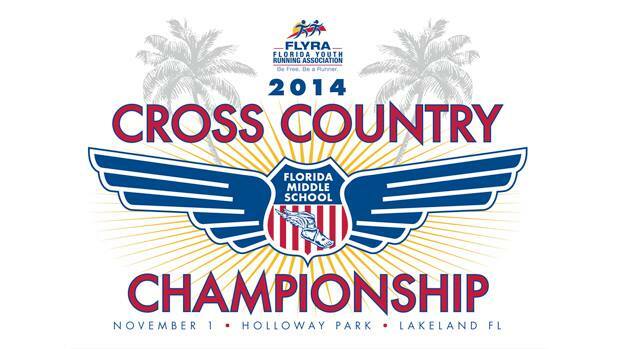 On Saturday, November 1st, a record field of over 1,000 middle school and elementary school athletes will descend upon Lakeland’s Holloway Park to compete at FLYRA’s Middle School Cross Country State Championship Meet. As in past years, middle school athletes will be coming from all corners of the state: Miami to Pensacola and Naples to Jacksonville. This year’s event will feature a number of new and fresh faces as five of last year’s girls top ten have graduated and eight of last year’s boys top ten have graduated. Race time conditions look favorable for temperature (59 degrees) and humidity (67%) and no chance of rain. It will, however, be windy with prevailing winds currently forecast to be at 14 mph with stronger gusts. FLYRA Meet Director Laura Fredrickson has planned a fun-filled event to cap off the middle cross country season. New this year are food trucks for hungry parents and kids alike. Flrunners.com will be on-site with plenty of coverage. Jeff Adams who took over 2,500 photos last year will be back along with Todd Grasley who will be shooting race video and interviewing the winners and top finishers. We will also have all the results, performances, and a complete recap of all the action! For those who have not previously attended a meet at Lakeland’s Holloway Park, you are in for a treat. Holloway Park is FLYRA’s answer to Tallahassee’s ARP: a cross country playground providing a true cross country test for the athletes and good spectating opportunities for coaches, family and friends. You won’t find any asphalt or manicured fairways/athletic fields at Holloway Park. You will find tree lined trails, changes of elevation and variable running surfaces (grass, some looser sand and hard packed dirt). The start of the course features a wide 200-300m gradual uphill climb before it levels off and transitions to some wooded and tree lined trails. There is a small uphill just after the mile mark and the final 1300m is generally flat with a few small changes in elevation sprinkled in along the way. Coaches and spectators, moving at a moderate trot and with little need for frantic running, can watch the athletes run the initial uphill segment, see the athletes at the mile mark and then (from the elevated pathways above the running trails) watch both the approach to the final 300m in the woods and then the final 300m as the runners leave the woods and enter the open final segment of the course to the finish line. 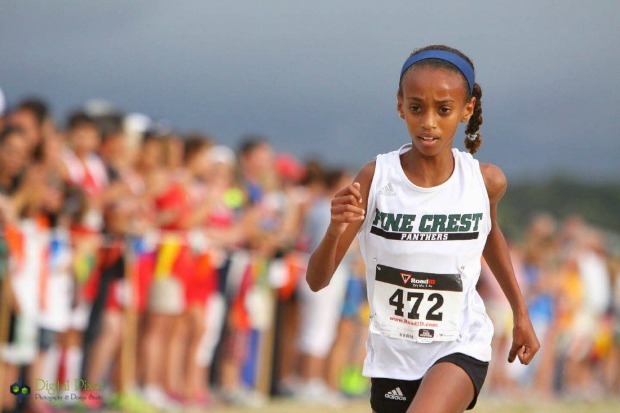 The diminutive figure of Pine Crest 7th grader Tsion Yared (pictured above) looms large over this year’s girls field. 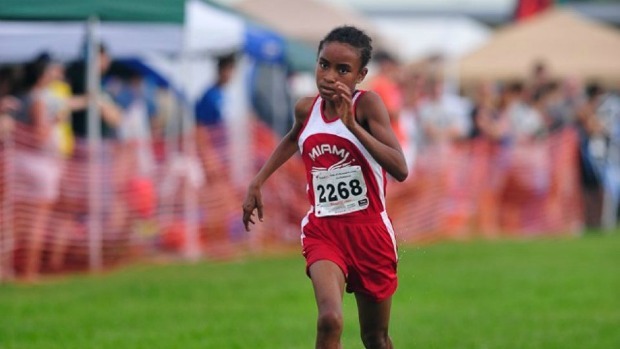 Tsion is one of the top female high school runners in the state and one of the favorites to win the FHSAA 2A Cross Country Finals at ARP on November 15. With a 5k PR of 18:08, it goes without saying that she is the prohibitive favorite in this event. She is the top returner from last year’s FLYRA MS State Meet and knows the Holloway course well. In addition to Tsion, her ms-aged and high school-competing teammates at Pinecrest, sister Mahdere Yared and Amanda Schwartz figure to finish in the top five. Mahdere (19:27) and Amanda (19:33) have been running a steady diet of 5ks at fast paces for the past two months and the significantly shorter 3k race length will allow them to bump up the pace per mile. If anyone can closely compete with the Pine Crest girls, it may be 7th graders Rahyah Andressohn and Natalie Varela out of Miami. Rahyah won all three of the MS Super Qualifier Meets she competed in and also knows the Holloway Park course well (having competed at the last two MS State Meets there). And you can’t mention Rahyah without also discussing fellow Miamian and 7th grader Natalie Varela who has finished a close second to Rahyah a number of times this season. However, just yesterday, at the Miami-Dade MS Championships, Natalie (12:23) won first place over Rahyah (12:31) and set a new MS 2.1 mile course record at Larry and Penny Thompson Park. The fact that Rahyah and Natalie regularly run the 2.1 mile distance at L and P in Miami will also aid them in competing on the shorter 3k course at Holloway Park. 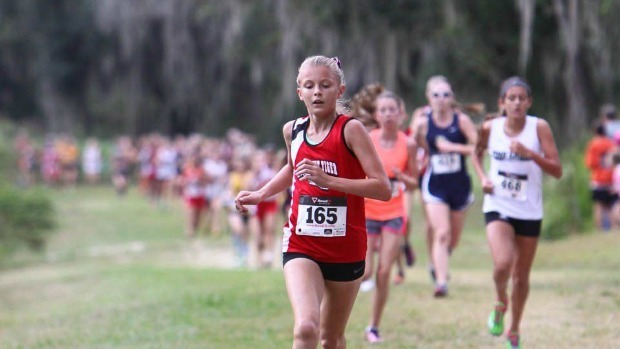 Eighth grader Cadi Rowe has the state leading time in the 2mile/3200 distance (12:06) and was the top Florida girl finisher at the recent Disney Super Qualifier. She has competed at the last two FLYRA MS State XC Meets and has also been running 5ks for her high school varsity team this season (19:28). Sixth grader Bella Pawloski owns the state leading time in the 3k event (11:09). Bella ran at last year’s FLYRA MS State Meet and earlier this month won the Pre-Heat Qualifier at Holloway Park with a fast time of 11:18. In addition to the above girls, look for the following athletes to compete hard for a top 10 finish: Lawton Campbell, Charis Ivey, Ayjah Silemon, Ashley Klingenberg, Audrey McAnally, and Katherine Resavage. The boys race has a number of leading candidates likely to finish in the top five. 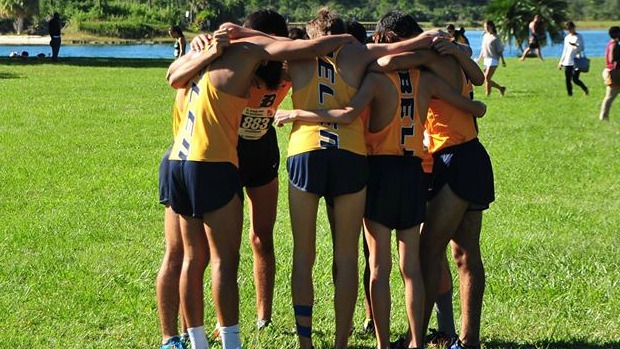 The big news here is that Belen is bringing their top middle school runners to the FLYRA MS State Meet this year. The Belen trio of eighth graders Rodrigo Madiedo, Sebastian Roa and Henrique Souza will certainly be serious contenders for top five finishers. Rodrigo won the middle school boys race at FLRunners as well as the Miami-Dade County Youth Fair MS Championship. Sebastian has finished behind Rodrigo at several races, but did beat him at 3k at the Pine Crest XC Invitational. Meanwhile, Henrique had a great race at FLRunners 15 where he finished second by two one hundredths of a second to Rodrigo. The Belen boys have great coaching and team strength and should be in excellent form to finish off their middle school season in style. Belen looks strong up front, but there are several middle school boys who have run times indicating they can compete with Belen’s best. Maclay’s Clayburn Milford owns the state’s leading 3k time having posted a scorching 9:41 a week ago. He has been running 5ks this season for Maclay High School and ran a 5k time of 17:39 at FSU Pre-State earlier this month. Training in Tallahassee, the hills at Holloway should not prove too challenging for him. Tampa eighth grader Josue Reyes has looked impressive this season. With the absence of Sol Weller, Josue has the top 3200m time at 10:55.45 or only two one-hundredths of a second behind Sol. Josue got wins at two Basic Qualifiers this season including last week’s Pre-Heat Meet where he ran on the Holloway Park course with a winning time of 10:30. 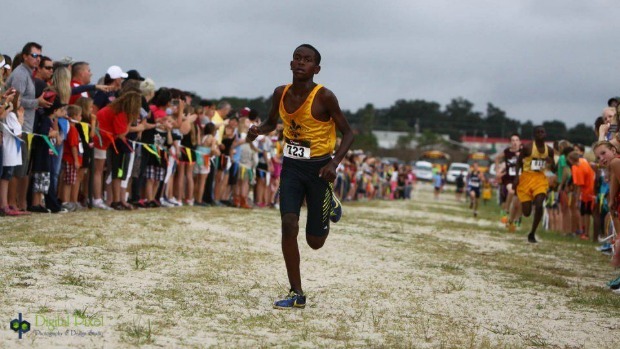 Trinity Prep seventh grader Mamush Galloway (pictured below) is ranked just a few tenths of a second behind Josue in the 3200m event with a stellar time of 10:56.04. Mamush has a 17:09 5k PR and last year was the only 6th grader to crack the top ten finishers among the boys. 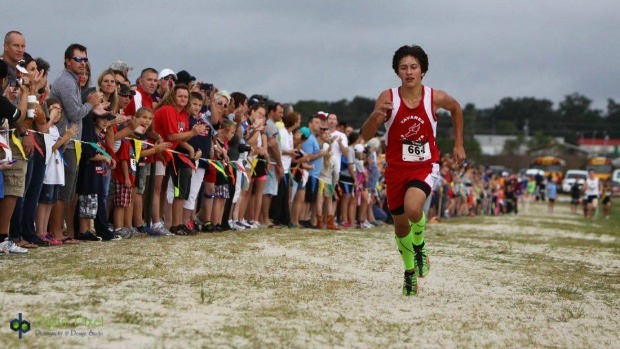 Tavares eighth grader Garrett Schilling (pictuved below) is the top returning male runner after finishing impressively in 3rd place at last year’s FLYRA MS State Meet. Garrett has had some inconsistent races this season. Earlier in the season, he looked in good form running 10:31 to win the Jim Ryun 50th Anniversary MS race and running 11:52 to win the Fleet Feet Invite against Belen’s best MS boys on a very soggy course. If he can regain his early season form, Garrett will be among the top finishers this year as well. In addition to the above boys, look for the following athletes to compete hard for top ten finishes at this year’s MS State Meet: Gabriel Curtis, Andrew Shepherd, Kayamo Galloway, Johnny McClure and Burch Greene. Good luck to all athletes running at this year’s record setting FLYRA MS State XC Meet. Have a blast and run fast!